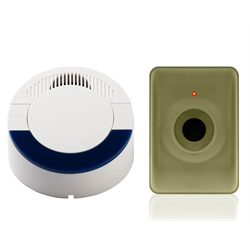 Get notified when someone or something enters your property with the Dakota Alert DCMA4000 driveway alarm system. With its PIR motion sensor, long range wireless range and easy set up, this may well be the best driveway alarm for general applications. The motion sensor may also be used for entrances, porches, or other areas you wish to protect or monitor. The Dakota DCMA4000 motion sensor is outdoor rated and will detect people and vehicles entering your property or driveway, sending a wireless signal up to a mile to the wireless receiver. When motion is detected, the receiver will flash an LED indicator and play your choice of notification tunes/tones. Note: The DCMA4000 replaces the DCMA2500 with up to double the wireless range, but it does not have any relay or 12VDC output. If you need to connect a strobe or other accessory to the receiver please consider the Dakota MURSBSKIT, Optex RCTD20U or the Mier DA600 system.